Comments There is something very mystical and mysterious about the cat’s eye gemstone. Every single stone that passes the hands has a different story to tell. 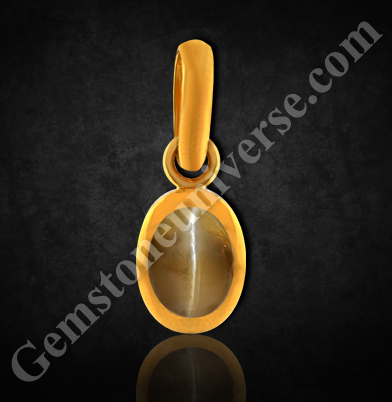 It’s as enigmatic a gem as the mysterious planet Ketu whose energy its represents.Featured today is an exceptional chrysoberyl cat’s eye gemstone from Madagascar. The 2.37 carat gem has a sharp chatoyant band running along the cabochon and has been set in 22 karat gold as a pendant. 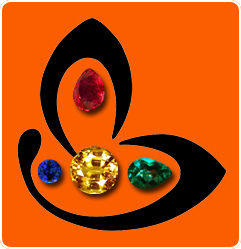 This chrysoberyl cat’s eye or lehsunia/ vaidurya as it is known otherwise, has an appealing brownish green color. Cat’s eye gem is used to harness the energies of the mystical planet Ketu – the South node of the Moon. He is the dervish of the zodiac and the situations thrown along an individual’s path during his dasha are also one of a kind. Life though, becomes a lot easier if the individual understands that ketu’s motive is spiritual evolution through difficulties. Wearing a cat’s eye (only after getting a proper recommendation) brings to smoothen life during its phase.